Our policy is helping guests to have a great experience staying or travelling in Karuizawa. 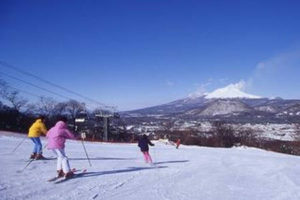 Karuizawa village itself has a power to refresh and people can have a relax time just to have some time in Karuizawa. You can travel any time throughout the year. Chaconne Karuizawa is a B&B which you may stay for overnight trip to Nagano area. Please enjoy staying at our guesthouse feeling like staying at your friend’s house or your second house. Our guesthouse is a wooden cozy hotel and have a dining room,free space and wooden deck. It is surrounded by green trees and you may wake up with cries of birds. 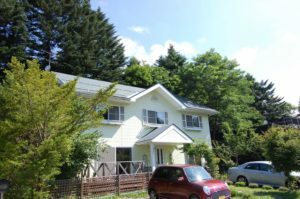 Convenient access from the Karuizawa station. 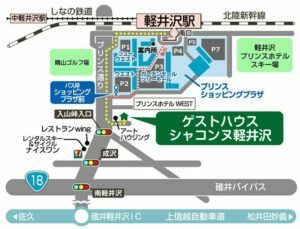 It is about 15 minutes from Karuizawa station on foot to our guesthouse which allows you to have your travelling more convenient.